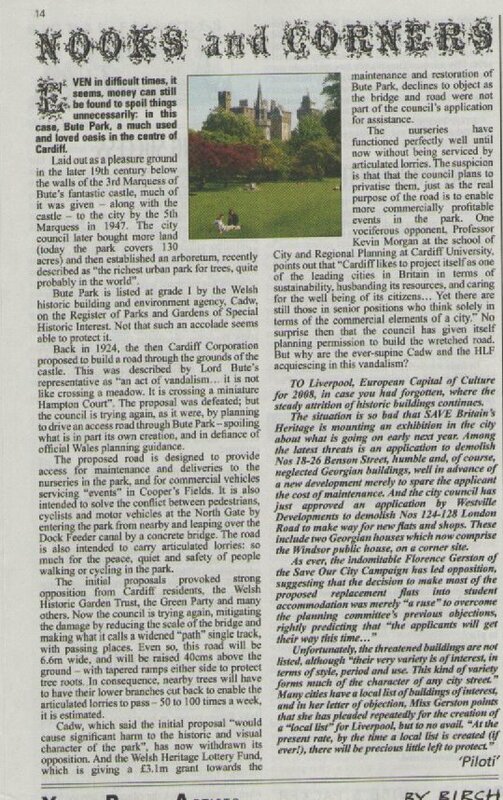 As a subscriber to the esteemed organ Private Eye, I was delighted to see that the November 28th 2008 issue carried this article about Cardiff City Council’s disgraceful plans for Bute Park, and the bewildering behaviour of the Welsh Heritage Lottery Fund in supporting the proposal to increase the traffic of articulated lorries through it. I understand there is to be a public meeting to discuss this on Friday December 12th, but the organizers are having some difficulty finding a representative of the Council who is willing to defend their conduct. I can’t say I’m surprised, but I also hope that it is not too late to persuade the Council to abandon their ridiculous scheme. I have complained before about precisely the attitude noted in the Eye, namely that the Council sees its Parks mainly as venues for promotional events and other commercialised ventures, whereas I think a Park is best kept as a Park so people can enjoy a bit of Mother Nature in the middle of the City. As it happens I walked through Bute Park this afternoon on my way back from Cardiff Bay where I had been paying the deposit and ordering wine for a forthcoming Christmas celebration in one of the restaurants down there. It wasn’t too cold (considering it is the last day of November) primarily because there was very little wind so I walked there and back from my house, doing a little shopping on the way. The Council gardeners have been hard at work preparing the borders and plots for the winter so these look pretty bare at the moment. The brown fallen leaves blend with the green of the lawns to produce a variegated groundscape which is very beautiful. Enough colour remains amongst the trees because of the presence of evergreens of various types thoughtfully planted amongst the deciduous trees. On a bright day like this the lack of leaves on other trees really opens up the sightlines in the park so one gets a wonderful sense of space. The landscaping isn’t all that obvious when the woods are thick with greenery, but at this time of year through the minimal foliage the gentle undulations created by Capability Brown can be clearly seen. The Park is more spartan than in the summer, though not at all less enjoyable. I love to see how Nature marks the passage of time like this. I would hate to live somewhere where the sun shines everyday and where the seasons offer no variety. With winter coming on there’s a sense of battening down the hatches and preparing for the tough times that might lie ahead, but also a reminder that eventually the cycle will begin again in the spring. There’s a sense of peace that comes from being attuned to this reality that is deeply therapeutic and which, in modern life, especially in cities, is an increasingly rare experience. Please, Council, don’t take this away from Cardiff! This entry was posted on November 30, 2008 at 7:23 pm and is filed under Bute Park with tags Bute Park, Cardiff City Council. You can follow any responses to this entry through the RSS 2.0 feed. You can leave a response, or trackback from your own site. It is interesting to ponder how different our way of life would be at various latitudes (starting with your own!) if the tilt of the Earth’s axis were different – ie, if seasonal changes were greater, or smaller. At the tilt we have of 23 degrees, there is a critical latitude above which some animals hibernate and some trees shed their leaves for winter. The public meeting was reported in the South Wales Echo, the local Cardiff area newspaper. However, the paper gives emphasis to animal pelt as far as I can work out.